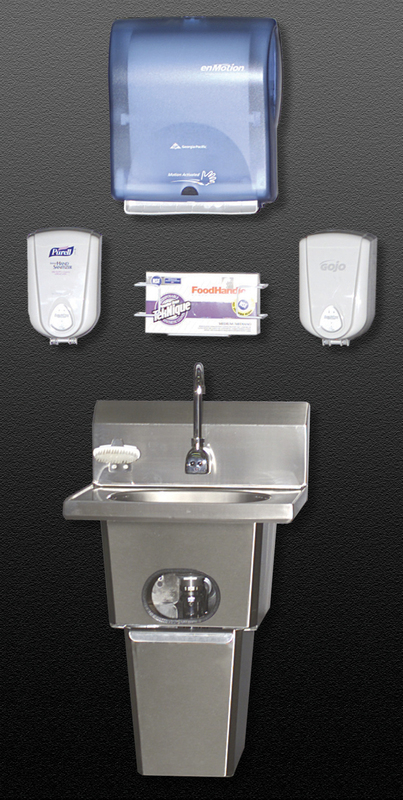 Eagle Foodservice Equipment Touch-Free Handwashing System. Eagle Foodservice Equipment announces the introduction of its new Touch-Free Handwashing System. This unique, new handwashing system incorporates ingenious design features that enable foodservice workers to establish safer handwashing practices, thereby helping to improve food safety and minimize contamination. Eagle’s touch-free handwashing system consists of a stainless steel wall-mounted handsink featuring a positive drain bowl for complete water evacuation, along with MICROGARD® antimicrobial protection for enhanced antibacterial capabilities. The handsink also features an “electronic eye” faucet that activates water flow via an optical sensor beam – thus eliminating the need for sink handles. An adjustable water pre-mix feature allows a comfortable water temperature to be pre-set for every use. Another key design feature is an off-the-floor slide-in/slide-out refuse container, allowing for better sanitation and easier clean-up under the sink. In addition to the stainless steel handsink, Eagle’s touch-free handwashing system incorporates several other wall-mounted components that represent the state of the art in safety and bacterial protection. Among them are an automated touchless towel dispenser from Georgia Pacific, a touch-free hand soap dispenser from GOJO Industries, and a touch-free hand sanitizer dispenser from Purell. The handsink system also includes a glove rack from FoodHandler that dispenses single-service gloves. The introduction of Eagle’s new touch-free handwashing system underscores the company’s commitment to promoting better hygiene in the foodservice workplace. The company is a founding member of the Handwashing Leadership Forum™. Established in 2000, the Forum is an alliance of advocates committed to lowering the risk of foodborne illness. The Forum provides education and information to foodservice establishments on proper handwashing practices. It has also developed the Team Rally/Handwashing for Life Olympics, where competing teams of workers compete for the best handwashing “performance” – the cleanest hands. According to Larry McAllister, president of Eagle Foodservice Equipment, better hygiene comes from both good equipment and good planning. “Placing handsinks in areas that are heavily trafficked is vital to achieving high participation,” says McAllister. “Workers are often blamed for not washing their hands, but it’s not practical for people to keep running to out-of-the-way sink locations between tasks. Ideally, sinks should be located within five feet of each foodservice workstation, and it’s a good idea for a handsink to be located at or between each prep location, warewashing station and server station, in addition to the chef work areas,” he notes. For more details on the new touch-free handwashing system from Eagle Foodservice Equipment, contact Lynda Donavon (ext. 3027) with sales inquiries, or Eagle’s Marketing Department (ext. 3129) with inquiries pertaining to marketing support. Telephone: (800) 441-8440 or (302) 653-3000. FAX: (302) 653-2065. Web site: http://www.eaglegrp.com.